I decided that my little leprechaun needed a name, so I looked up male Irish names and Torin Ailfryd O’Patrick was born. 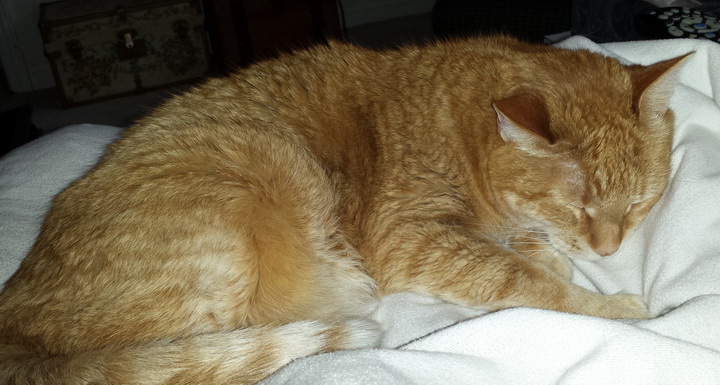 His name means: Chief (Torin) elf counsel (Ailfryd) of noble descent (O’Patrick) or Toppy for short. I try and remember to take a picture of the canvas I am stitching to use for reference only; after I am done stitching Toppy I will take another picture for my stitched piece notebook. I have been trying to keep track of what I stitch and have been cataloging pieces I find that are not in my files. 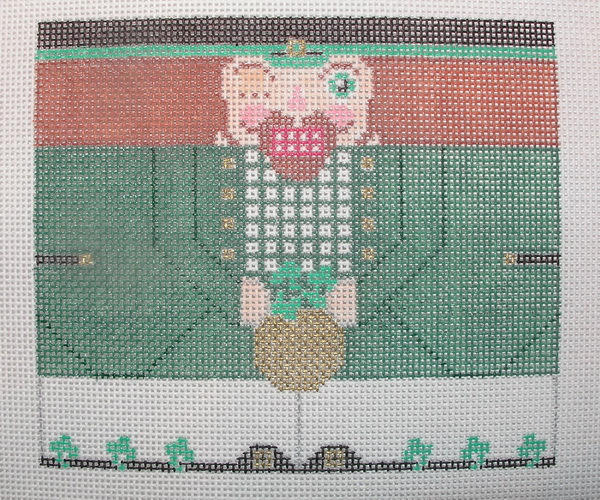 I wrote about this a couple years ago (https://sudukc.wordpress.com/2009/08/29/keeping-track-of-needlepoint/). New needlepoint canvases have a stitch guide to go with them, some have stitches others have just the threads I used listed. 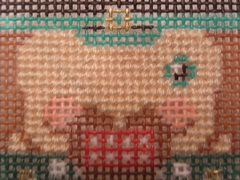 If a needlepoint canvas has a face I usually try to start by stitching it first. Faces give the piece personality and also can give a clue into how the rest of the piece is going to be stitched. 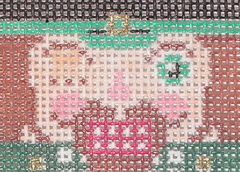 I think needlepointing faces can be daunting especially when trying to make the face appear realistic; and I think Basketweave & Continental are best suited to either realistic or interpretational stitching of faces. I have seen a Long & Short stitched face that was lovely; it was executed in 1 strand of silk and I doubt that any stitch was more than 4 threads in length. 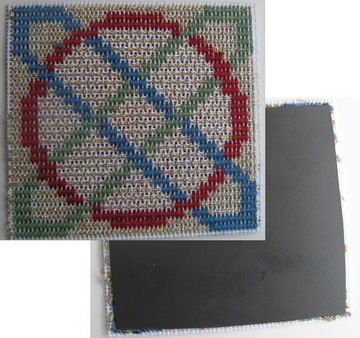 But for the most part I feel Basketweave and Continental are the best; and very realistic complexions can be stitched using one of several thread blending techniques. 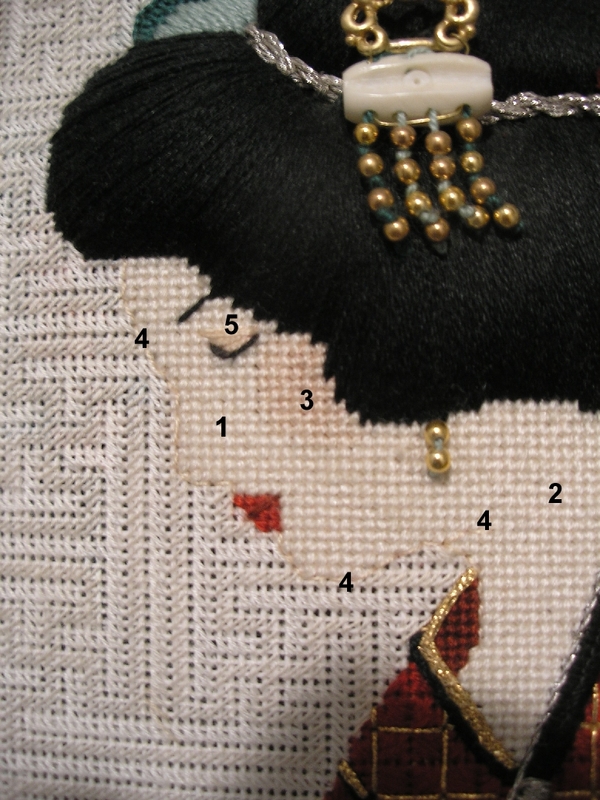 Sometimes it is best to stitch the entire face and then stitch the special features over this base; other times stitching the features within the face are more desirable; each canvas should be judged on its own. The first angel is a Gay Ann Rogers (http://www.gayannrogers.com/site_2/Home_Page.html) tree topper and her face is stitched very simply with just eyes and mouth stitched also; there is no shading, outline or detail. The next angel’s face is a Brenda Stofft (http://www.brendastofftdesigns.com/) angel class, taught many years ago but such a classic. It is difficult to see in this picture but her shading is delicate and realistic. She was stitches with 4 colors of floss, all in Basketweave and Continental: #1 outlined her face, neck, chin and tip of her nose, #2 filled in on either side of the nose and up into the eye area and also under her chin, #3 was stitched with a needle blending technique using two colors of floss just to give the suggestion of blush cheeks, #4 was the remaining parts of her face. This Lee (http://www.newleesneedlearts.com/) Geisha canvas was a real challenge. I wanted her to be as realistic as possible and to have the ivory complexion of the geisha. There are 5 colors of silk floss mostly stitched in Basketweave and Continental with an overlaid and outline stitch: colors 1-2-and 4 were so close in value that I barely could tell them apart when not in their original skein. 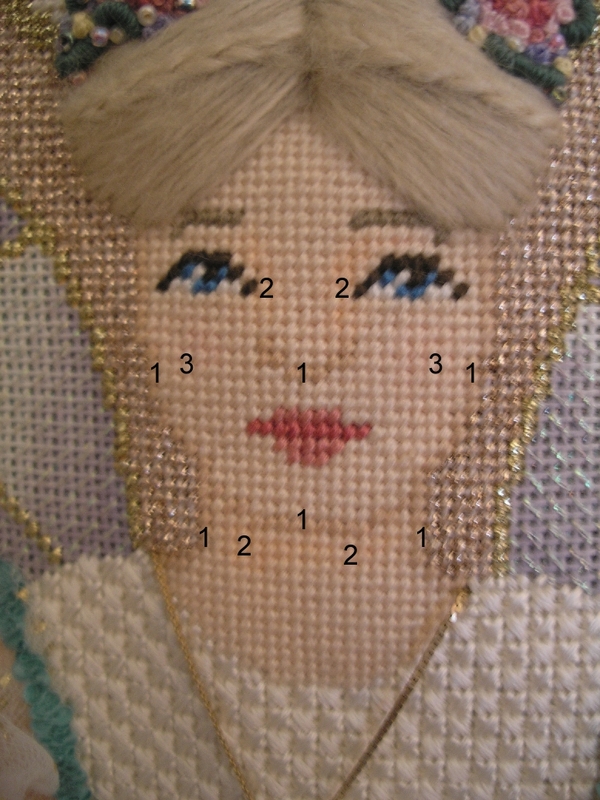 #1 is the lightest of the silks used on her face; #4 I knew I was going to outline the face but I also wanted the chin to be defined but not by an outline stitch, so there are continental stitches along the chin area that are thread needle blended of colors 1 & 4; color #2 is under the chin; #3 is the cheek area and is the same value as color #5 but with a pinkish tint to this color family; # 4 is the outline used around the profile of her face and one stitch into the chin area before the tent stitches were used to suggest the rest of her chin; and #5 is the darkest of the flesh colors stitches over the Basketweave to suggest her lowered eyelid. Ready –to Go Santa (Beau Jeste canvas/class and another fun face) He just has two colors #1 for basic face and #2 outlines nose and is also used for his cheeks. If this had not been a class, I might have overlaid his nose area with #1 in a horizontal Gobelin. Back to Toppy’s face. 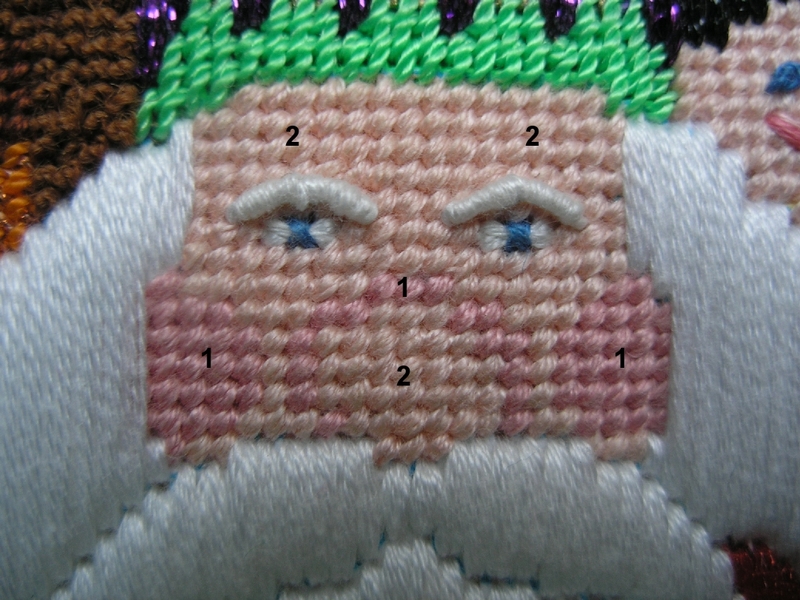 I am stitching his face in Basketweave; stitching over his closed eye, eyebrows and nose areas; his open eye cheeks and mouth are left unstitched. Later this week, Toppy and I will be back with a sparkle in his eye and the details of his face. Do you name your canvases? So how do you approach stitching canvases with faces? 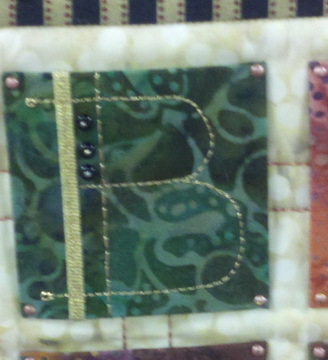 I love hearing what other stitchers do to make stitching their canvases more personal. P.S Happy Valentine’s Day too. Hopefully this month is about over and the rest of the year will be smoother. I went for another check-up on my eye and after a lengthy check-up was pronounced “Okay for another year, unless something unforeseen happens.” I had a strange thing happen last week; felt like my left eye re-set in the socket…is the best way to describe it. I think I was more aware of it because of recent eye concerns. Anyway yesterday the sight in my left eye had gone from 20/35 to 20/20 and after a lengthy (only 1 ½ hours this trip) was pronounced ready to go. Only thing doctor could tell me was the vitreous (clear gel-like fluid that fills the eye) had detached from the back wall of the eye and there was no damage. Also thought what I felt was maybe the detachment although she could neither prove nor disprove this theory and had neer had anyone else tell her of that sensation. Glad this is behind me and my biggest problem was I couldn’t see and had a head ache most of the day and evening. Sigh! Since thing seem to happen in threes…two other of my friends have had more serious health problems than I; Kidney stones and a broken femur (and no she didn’t slip on the ice…we’ve had no ice yet this year) and I wish them both speed recoveries. Hopefully this I all the bad news for a while and by spring we are all able to get out and play again. convention but I don’t remember which category, but there was something wrong with this one and so she stitched a second and was going to throw this one away. I cabbaged on to it, finished is on a large button form and it hangs in my angel room (aka: dining room) most of the time. Virginia is one of those exceptional stitchers…she has tried most every technique (some she likes better than others), she stitches on 40 count silk gauze like it were Congress cloth and stitches well into the night. 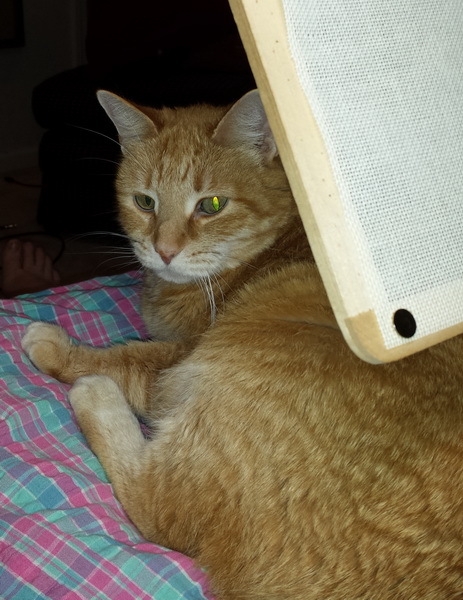 I consider her an honored woman among stitchers…she has forgot more than some of us will ever learn. She knows the basics of stitching and executes them very well, but she can break the rules too. Than you Virginia you are a treasure. And last night, even though I could not see well and had a head ache, my friend Patty B drove me to the EGA meeting…and I am so glad we went! Remember me telling you about this fabulous quilter, Janet Stone… (https://sudukc.wordpress.com/2011/05/18/the-art-of-machine-quilted-quilts/)? 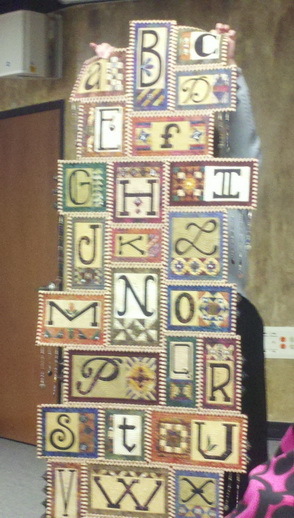 Last night at the local EGA meeting Janet was the program and she showed all 10 of her beautiful quilts. Her first quilt she stitched individual blocks and the joined them together by hand. 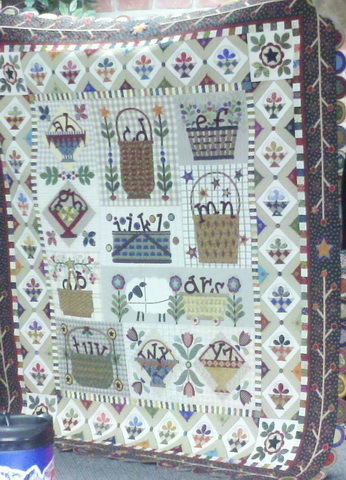 The second quilt was inspired by the first…she decided to make a quilt with a block for each letter of the alphabet…and oh yes, then she machine quilted (free hand all the names of these quilts in the border. Each quilt had a story and a reason to make whe ther it was figuring out a new technique, using a new and different thread, or using embellishments she found and wanted to incorporate into a design. She gets these ideas draws them out, makes her own patterns and just puts them together; she made it sound so simple. She has added touches to a quilt to make it large enough to enter in a category; removed borders from a quilt two and three times to get it just right, but her favorite thing is the embellishments she adds to her quilts. 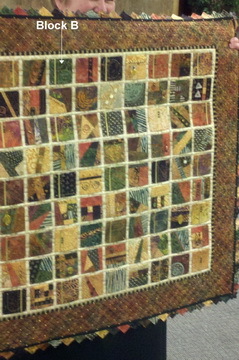 Each of these quilts had similarities but are also so very unique in their design. Her sense of color and design is incredible, her embellishments are part of the design and not just added do dads, and her quilting is so unique and yet precise. 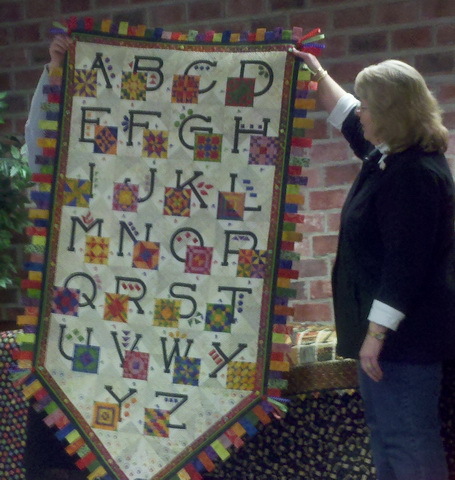 Janet talked about each of her quilts and you could hear the love of the art she creates in her voice. She was delightful and so unassuming about her talent. What a treat! She can create about two quilts a year…and wants to write a book someday about her 26 quilts (her goal)…where do I sign up? Oh yes and this is my tempory desk set up while we are remolding a space for our computers to have a new home. My family thinks I have become too engrossed in my tablet, but I have found Netflicks and the PBS programs I can now watch hours of PBS and stitch too…oh life is good. Over the week-end while playing nurse to the surgery patient (Grandson, had nose surgery), I finished my ABS Design angel , Anne Stradal designer (http://thecapestitcher.blogspot.com/ or (http://www.absdesignsonline.com). I asked Anne to paint me a back for the angel and she graciously did it. I just love this angel, Thank you Anne for all you great work. I could not have done this project without you. Like I have said before…finishing is not the best part of needlepoint for me (I rather stitch bullions in Marlitt) …but if you are a finisher at heart, this is the best part.Isn’t it wonderful that we all have our own strengths! I am not a finisher, but for my long time friend I can do anything. I found the lining fabric at a JoAnn’s store and it is perfect! I finished each piece separately and then joined her sides and top. I originally intended to put a bell in the bottom, but then I decided that would hide the great lining. So I decided she would be finished as a tree topper. She can free stand or if Carol would like I will make her a cute stand out of painted wood. The real challenge was the cording. Lucky for me I gave this some thought before I started. I knew I wanted two colors of cording: Gold around wings and halo and the Confetti Fuchsia for the skirt. I left the sides open at the waist and joined the rest of the way around the top and sides. The gold cord was easy: point A to point B. The Confetti Fuchsia cording was a bit more challenging. One continuous length would not work. I made one cord the length of one side (Fuchsia cord 2) and the other cord was the length of one side and around the bottom. I looped cord 2 through cord 1; and I also looped cord 1 though itself. I started from the loop of cord 1 and pinned around toward the knot. When I got to the place cord 2 needed to be placed I pinned the loop in place and came back to pin cord 2 in place after pinning cord 1. I also stitched in the same manner. Of course I had to do it twice because it is easier to stitch from right to left with the needlework facing you and of course the first time I pinned it incorrectly. It took me the better part of the week-end to finish Abagail but she is now in the mail headed to her new home to do her job. I will make some changes in the next one I stitch, but this one needs to fly off ASAP to bring a smile to my friend. Next time, I would change the panel down the center, definitely should not be pink. I also wonder if an overdye would not be just as effective as the two colors used in the overskirt? I am going to look for a “breast cancer” small print fabric to finish her…any suggestions? Notice I have not given her a name? I have mixed emotions about giving her a name. My Grandmother used to say that dolls did not need faces because the person that received the doll would see her face and that would become her name. 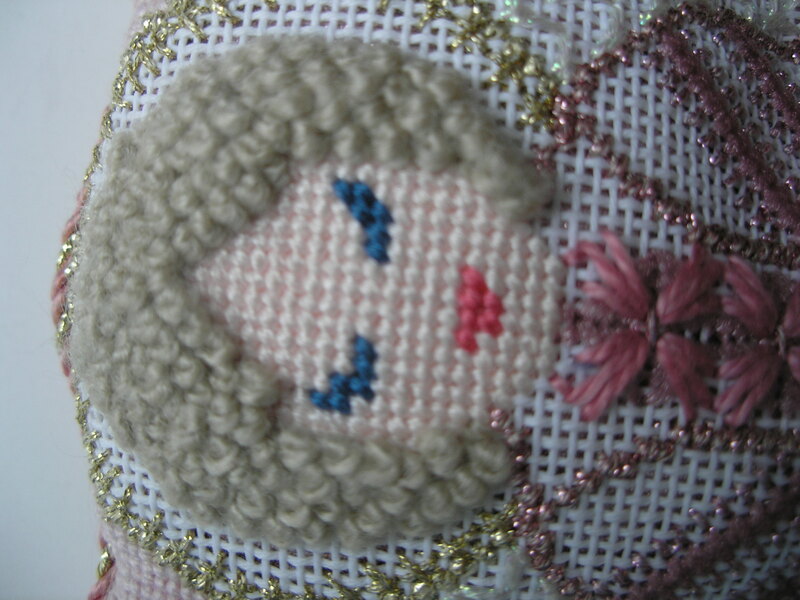 But I always stitch the face first because I think that gives her a personality and usually a name for me. But this time, no name came to me until today when I photographed her. Abagail, came to mind but when I explored my mind to find out why that name came to mind I did not like the thoughts that came to me. I decided I should start with “A” and then I could stitch others for those who might need an angel. I do pray that this is not an omen, and that I need only stitch very few of them. Maybe we all should see if we could stitch something for a breast cancer awareness auction. Does anyone know of such an auction that we could stitch a breast cancer canvas and all the money would go to breast cancer research? I’m game for this. I took the week-end off from computer work and played. I stitched, frog stitched and stitched some more…I made progress. 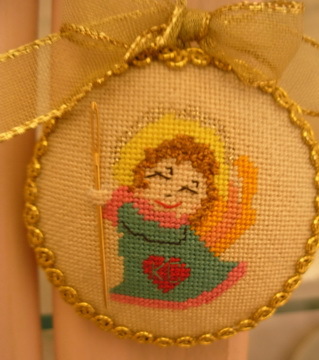 I took my angel to a guild stitch-in and asked them if they could see the differences in the gold wings and halo. The consensus was it was not different but appeared that way because the difference in threads (halo is ribbon and wings are braid) and the different angles of the stitches. I’ll take their word for it, sometimes I think we are too critical of our own work. I love guild stitch-ins; you get to see so many enabling canvases. 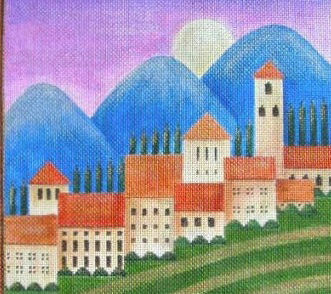 Mile High Princess has two 4th of July canvases that would be so-o-o-o cute on my mantle MHP: LD 4 and 5 (cannot find pictures online), Sharon G Riviera Row (http://www.sharong.com/catalog/landscape/images/SCT08Riviera.jpg) , lot of Christmas ornaments and of course a few pieces from Calloway Gardens Needle Arts (http://www.callawaygardens.com/Callaway/info/calendar/calendar.needlearts.event.aspx). I love to look at everything, it is so interesting to me that many woman have the same interest and yet such different taste in style, color and method of stitching. As a Catholic priest once told me about Catholics: “Catholic is not better than just different from.” That is true of many things and especially our needlework…none is more correct than another, just different from. If you would like another exercise in not better than but different from…join Gay Ann Rodgers (http://www.gayannrogers.com/site_2/Home_Page.html) on her web site and pick you favorite background…and then if not a member join Shinning Needle Society (SNS) and weigh in on your favorites and why. Membership to SNS is open to all stitchers, for membership, write to KateGaunt@aol.com . I think it has been very interesting, some of my favorites have changed and some of my favorites others do not like at all. Another not better than…just different from. Another thing I did this week-end was to figure out my way around my Facebook page. I obviously joined in September 2008 to be part of The Needlework Retailer. Then I kept getting invitations to be a friend, but since I didn’t think I had a Facebook account I never responded. 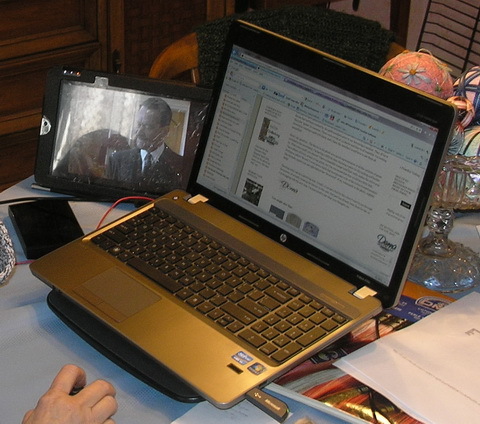 My Grandson, Josh told me I had an account but I thought it was just because he used my computer. Well, I do have an account, I do have friends but ya know what? 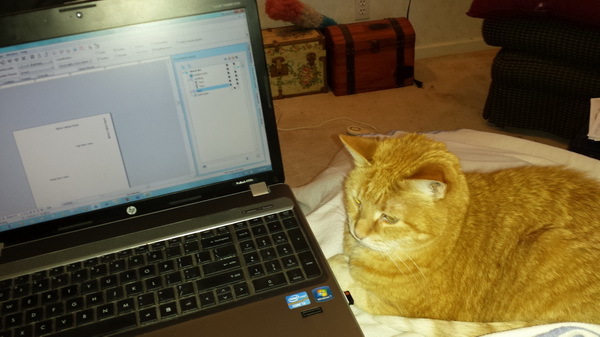 I can barely keep up with a blog and email. So if you need to contact me, phone still the best or email . I will always prefer to hear the voice of friend or family and I do read my emails…and I guess now occasionally I will open my Facebook account just to see what is going on. Now I need to get startd on making my Valentine cards for my Grandkids and get them in the mail! Still working on my ABS Angel…I think she is so cute. Everyday life seems to be keeping me from as much stitching as I would like. Also, does anyone else notice the difference in the gold on the left wing? Right wing seems to be alright. This is really strange since all the thread is coming off the same spool. The right wing is a different gold than the halo too. Yet both have the same number, one is a ribbon and the other a braid but that should not make a difference. Oh well, maybe my eyes are just playing tricks on me. I have another computer project I am working on and today it dawned on me next week is Valentine’s Day and I haven’t stitched heart one. May just have to miss the cupid day this year and concentrate on St. Pat’s Day. And then life seems to intervene also…Our Grandson Josh who lives with us sprained his ankle yesterday. At 8:15 (long before a doctor’s office was open) got a call from Josh’s High School. He had twisted his ankle and the nurse thought it should be x-rayed. 3 hours later at a local hospital emergency room, sure enough it was broken. Not a very bad break, the tendon has separated from the bone, they called it an emulsion fracture. But they did immobilize his foot and give him crutches. All of a sudden I noticed him grinning from ear to ear…asked him what was so funny and he said, “I have crutches…these are girl magnets.” Oh to be a teen ager again! And today was beautiful in the midwest…70 degrees a bit windy but who cares. It was a taste of spring! Had the doors and windows open to get the house aired out. I know we will pay for this but it was worth every degree! I know I heard that dreaded 4 letter word from one of the weathermen, but I am ignoring it. Also finally succumbed to Facebook and opened an account. I still don’t know why I need it, but I’ll check it every so ofter and one of these days maybe even spend some time figuring out what’s so great about Facebook. I did join JODY DESIGNS Needlepoint Group. It’s open to all stitchers and looks like it will be fun. I just need a couple days to explore and Josh to show me around. Young people know everything about this new technology. Tomorrow I am off to stitch with guild friends and so now I need to get back to the computer.